Half a dozen or so ladies sat around a large dining room table in a room with floor to ceiling windows overlooking Lake Hamilton. Some perfecting their hair and makeup, others simply enjoying their time together while sipping from their personalized mason jars. As they prepared for the day ahead, they listed to a mix tape the groomsmen had prepared for the occasion the night before, complete with their own recordings of silly commercials, radio talk show segments, and sentimental tidbits from each of the men who held such a special place in Ryne and Tara’s heart. Their thoughtful faux radio show was the perfect background for a relaxed morning, overflowing with excitement for the day to come. 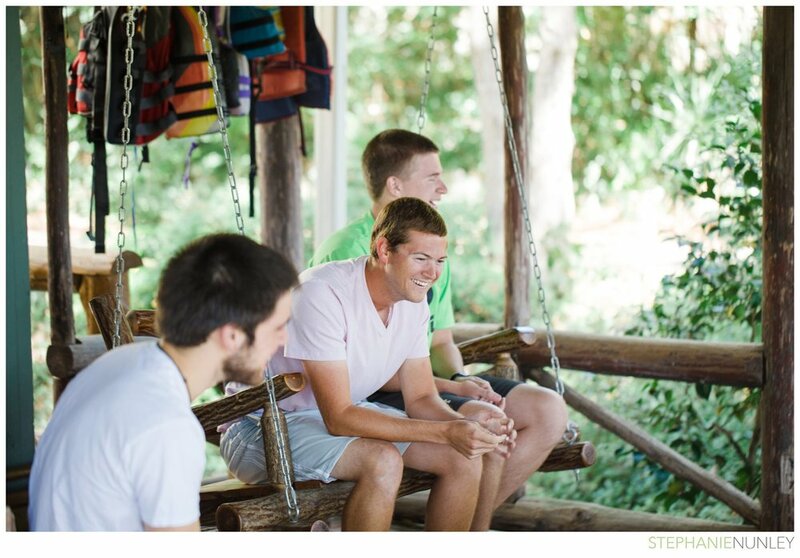 Soon, Ryne arrived at the lake house for his first look at his beautiful bride. Their time together was sweet and meaningful, and when it was over, the bridal party cheered from the balcony above. We then headed to Garvan Gardens for their ceremony, which was filled with natural beauty from the beautiful glass chapel with stunning architecture. After, their reception at The Regency was a fun time of celebration for the new couple and their closest friends and family. Overall, their day was elegant, fun, and perfectly represented the two of them as a couple. Ryne and Tara, thank you for making your wedding so much fun to document, and for your friendship and kindness during this season of your life. Lucas and I think the world of you two, and we wish you the absolute best in your new journey together!